On January 31st, 2016 there was a severe flood on the South Yuba River in the Soda Springs area. The flood inundated Soda Springs Rd at the road bridge and cut off the Serene Lakes community for about 8 hours. While the flood was ultimately due to an El Nino induced atmospheric river event that dropped almost 5 inches of rain on the Donner Summit area coupled with a rain on heavy snow condition, there are some interesting lessons to be learned from this event. In this article we discuss some of the contributing factors that led to this event. In the summer and fall of 2015 one of the strongest El Nino events recorded formed in the Southern Pacific. The potential for a wet winter in California and heavy snowfall in the Sierra Nevada mountains was predicted. True to form there was heavier than normal snowfall in December 2015 and January 2016. By the end of January there was a base of 6-8 ft of snow blanketing the Donner Summit area. At the same time a warmer weather storm brought in a heavy band of moisture known as an atmospheric river. The result was very heavy rains for a 24 hour period in the Donner Summit area that dropped about 5 inches of water onto the snow base to set up a rain on snow condition. Rain on snow events often result in flooding conditions due to a number of factors. The rain water does not reach the ground but is channeled laterally though or on the surface of the snow. The warmer rain water melts a small amount of snow adding more water. Snow and ice can dam the water causing pooling and then torrents when the snow/ice dams give way. All of these things occurred on Donner Summit at the end of January. With rain on snow conditions most of that water cannot be absorbed by the soil and much of it flows down into the South Yuba in the Van Norden Lake flood plain and then down the South Yuba River. Even if only half of the water makes it through the snow and down to the river that would by over 1200 acre-ft of water. For those of you that aren’t familiar with thinking of water in acre-ft, that would be approximately 400 million gallons of water. I think it is pretty obvious to everyone that with this huge amount of water surging down the Yuba channel there was bound to be flooding. After the heavy rains on Friday the water drained out of the watershed refilling the Van Norden Lake bed and then overtopping the spillway and overwhelming the narrow Yuba River channel in Soda Springs. As an aside the draining of Van Norden Lake last summer did not have negative affects on this flood. Van Norden Lake only holds about 180 acre-ft of water. While it may have helped to delay the storm surge, it would also be overwhelmed by the sheer volume of it. To be clear, this flood was really a foregone conclusion considering the amount of rain that fell on the summit in such a short period of time and the prevailing rain on snow conditions. There were however some interesting complications that were the result of both natural and human activities that may have exacerbated the situation. Consider the map in Figure 2 which really shows much of the situation that occurred. As discussed above, there was a huge amount of water trying to get out of the Summit Valley. Once it got past the spillway of the dam the water was concentrated in the narrow Yuba channel. Unfortunately, that channel is further constricted by the bridge across Soda Springs Rd. But even before the flow reached the bridge there was a huge plug of snow and ice that had formed from just above the bridge to the spillway. 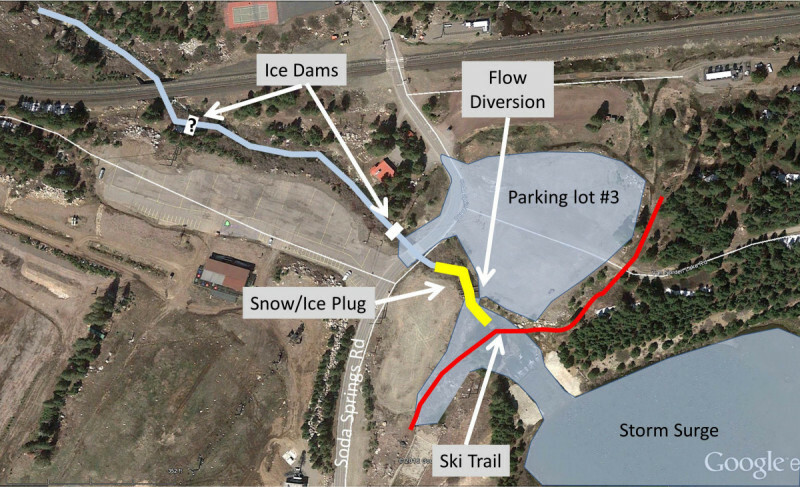 This plug was the result of natural snowfall and more importantly cleared snow from the parking lots at Soda Springs Ski Resort and the compacting of a ski trail by Royal Gorge Ski Resort. The snow was blown out of the parking lots and packed into the Yuba channel while groomers continually packed snow on the trail over the river channel When the storm surge hit the plug it filled up the basin just below the dam until it eroded out a channel that diverted the water north into the Soda Springs #3 parking lot. The diverted water turned the parking lot into a lake 2-3 ft deep. The water then curved back to the Yuba channel covering the lower Soda Springs Rd with 2 ft of water. But this was not all. The temperatures plummeted into the single digits and as a result ice dams formed downstream of the bridge and caused the water to backup even more. It wasn’t until those ice dams gave way that the full flow of the Yuba was restored below the bridge and the water level dropped to a level that was passable and the road was reopened late on Jan 31st. There was a repeat of this event the next day when again ice dams downstream caused the road to flood again for a few hours until the dams gave way. Finally, an excavator was brought in on Monday, Feb 1st and it removed the ice plug above the bridge and restored the blocked channel and stopped the diversion of the water into the parking lot. The normal flow of the river was restored and by this time the storm surge was receding and the road was clear again. Flooding events like this one could become more frequent in the future and modifications to the Yuba river channel, especially at the Soda Springs Rd bridge should be made to better accommodate heavy storm surge. 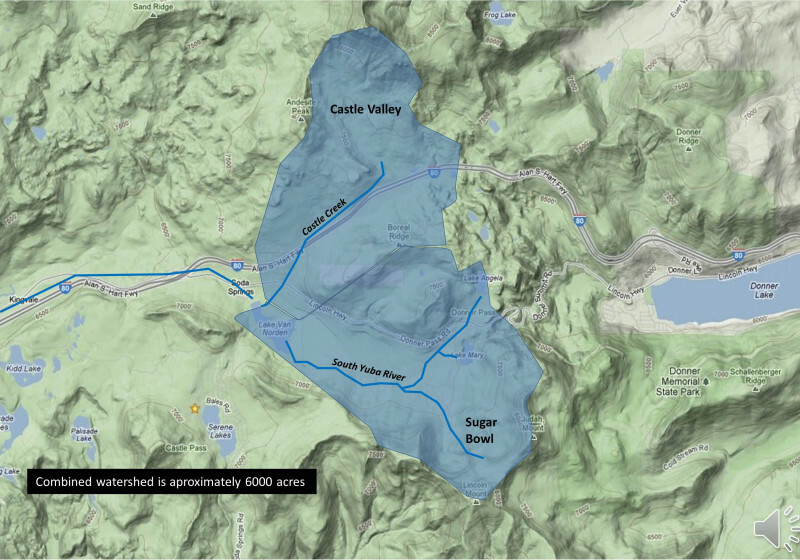 Proper drainage is extremely important for an area that is at the crux of drainage for the entire Summit Valley and Castle Valley water sheds. Every effort should be made to keep the river channel clear during the winter months. Snow should not be cleared into the river bed and ski trails should not be run across the channel blocking proper flow. Considering that Soda Springs Rd is the only winter time access to the Serene Lakes Community, keeping the Rd clear is critical not only for access but also for the safety of the community. The situation at the Yuba river bridge should be a top priority issue for Nevada County. This is not the first time the Yuba has flooded and it won’t be the last. We really have no control over nature. However, we do have control over the proper construction of our roads and regulating our water ways. It would seem that if these events may become more frequent in the future, there should be construction modifications and changes in snow removal that will minimize the effects of extreme events like the one we just experienced.